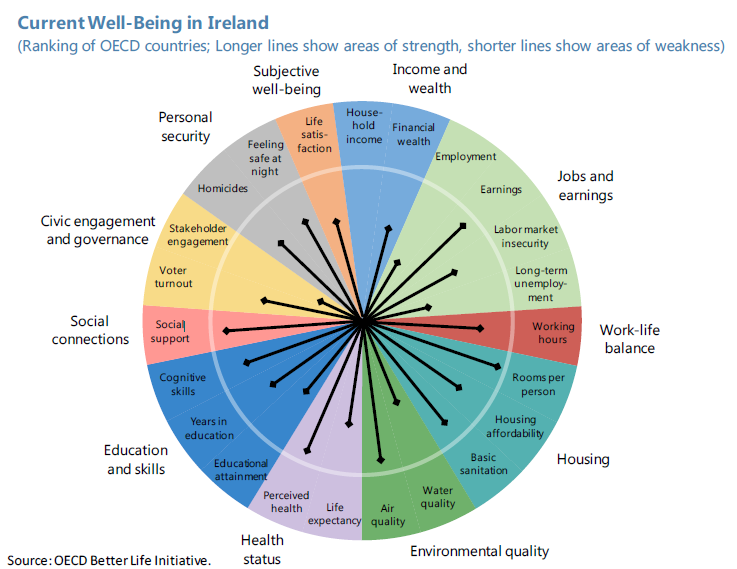 “Ireland is characterized by one of highest dispersions of market income among EU (and OECD) countries. Specific features of the Irish economy, as well as specific structural gaps, contribute to explaining this situation. Ireland’s tax-benefit system is one of the most effective in the EU in redistributing income, thereby mitigating income disparities across a range of factors (including regions). A relatively progressive tax system funds a robust system of social benefits, a significant share of which is means-tested. Despite the severe financial crisis and substantial budget cuts, the government succeeded in preserving most welfare expenditure, which provided an important cushion against the worst effects of the crisis. This helped safeguard social solidarity and cohesion. During the crisis, the elderly were shielded more than younger generations, who also face more uncertain job opportunities than before the crisis. With the economic recovery and the associated decline in unemployment, including youth joblessness, the intergenerational distribution has shown some improvement. Nonetheless, it would be useful to consider potential steps to reinforce the current welfare system to address future challenges.